Born Sept 16 1988 in St. Louis Missouri the oldest of 10 brothers and sisters total. I grew up in the city naturally always into sports and pushing my own limits. We moved around a lot as a kid and I went to a lot of different schools. I always enjoyed meeting new people and always had a passion that was driving me. Tried plenty of sports growing up ranging from, Hockey, Soccer, and baseball to my first true passion which was skateboarding. I remember skateboarding as a youth and teenager. This activity always gave me a special kind of thrill that had me coming back for more. Skateboarding was the first thing that I became truly passionate about. It was a very satisfying feeling to keep trying a trick until I landed it perfectly. Having skateboarding as part of my childhood truly helped me focus my energy’s on constant progression. I loved learning from others and using my own creative sense to try new things very similar to learning new things with disc golf. I enjoyed the time hanging out with friends and pushing each other to become better. Skateboarding was an escape for my situation at home. I never grew up in a family that had much money. I remember skateboarding for miles into town when we lived on the outskirts because gas in the car was even an issue. I learned that its ok to grow up poor it just gives perspective and reason to push even harder. I pushed myself to go bigger and go harder just for that feeling of gratification. It was very empowering to be one of the smaller kids around doing the biggest tricks. I quickly made a name around town as a young daredevil, even made it in the local newspaper a couple times. Right around Jr High 8th grade I moved back to St Louis after living in a smaller country town for five years or so. I was living with my grandparents but decided it was time to move back in with my mom. Once I moved back to St Louis I started playing Disc Golf with my uncle David McCormack. My uncle would take me out to the course every once in a while when he had some spare time. I later moved in with my uncle about one year later. This particular uncle was a professional disc golfer from the beginning competing nationally and even internationally. 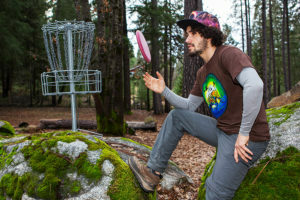 David taught me a lot about the sport of disc golf. I soon became hooked on the feeling of being out on the course and testing my own abilities. Disc Golf was starting to really become a part of my life quickly. I was transitioning from my dreams of becoming a professional skateboarder to a professional Disc Golf player. I was moving up the ranks quickly playing in jr tournaments and starting to travel to boarder states for competition. My first World Championships was in 2004 Da moines Iowa where I got to meet many of the top pros at the time. This tournament opened my eyes to how big the sport was getting around the country. I was stoked to compete against other Juniors that were around my age and skill level. Some of the kids I competed against in my first World Championships are some of the same kids I compete against today. Starting in High School the following year I practiced and more into playing disc golf. This sport was giving me a place in this world and I just kept wanting to absorb myself with more. Whatever disc golf was doing to me I knew I had to have more. High School was an interesting time in my life like many young adults I was finding out who I was. Disc Golf kept calling me back to the track. After school, sometimes during school I had to play and I wanted to get better. I had my mind set on becoming the best player in the world. Whatever I was going threw at the time with family problems or just overcoming problems of my own disc golf was there to lead the way. Of course there were distractions like girls and friends pushing me or pulling me in certain directions. I continued migrating towards my passion to progress at disc golf. I continued to move up the ranks from a Junior player to an Advanced player then becoming Pro right out of high school. Once I was 18 my high school days were just a blur I know it doesn’t sound good but I didn’t plan on going to college or think for a second I was going to get another Job. Disc Golf was the one thing fueling me and one thing that kept driving me. I enjoyed competing with others and the satisfaction of winning was always something I strived for. I got my first Pro win at a C tier in Olympia Fields Illinios back in 2006. My first A tier win at the Illinois Open in 2008. It wasn’t until 2009 that I finally won my first National Tour in Scottsdale Arizona at the Memorial Championships. Later on that same year I went on to win my largest tournament and one of the most prestigious events in all of disc golf the United States Disc Golf Championship. Since I started competing in the Professional Disc Golf Association I have had 89 Career wins. I look forward to passing the 100 career win mark in the near future. Disc golf has brought me around the United States, Over seas to compete in throughout Europe and even Japan. This amazing sport has a couple lifetimes of priceless memories that I wouldn’t change for the world. On top of having somewhere to clear my mind, This sport has allowed me to meet some of the most amazing people on earth. I’m lucky and honored to have such amazing friends around the world. These people have opened their home to me and others like me. Shared their favorite places to eat while on the road and even given up their own beds when the disc golfers come into town. Its a great honor to play professional disc golf for a living. I look forward to an even greater future meeting more people I can call friends and sharing my love for the sport with so many more people. Check back soon for 2017 Tour Dates. Great story, Nikko! I’m so stoked one of my favorite players is living his passion. Thank you for your continued progression of the sport and for this website and all that you do with Fly Life! That said, I know this bio is in your voice but it might be a good idea to get an editor to help with some of the grammatical stuff. Just a thought, man. I want to see you succeed and having a website that gives off a professional vibe is important. Again, Congrats Nikko, you are truly one of a kind!